This is a great character driven story that develops Karai as a character. It also adds in plenty of drama to the Foot Clan. 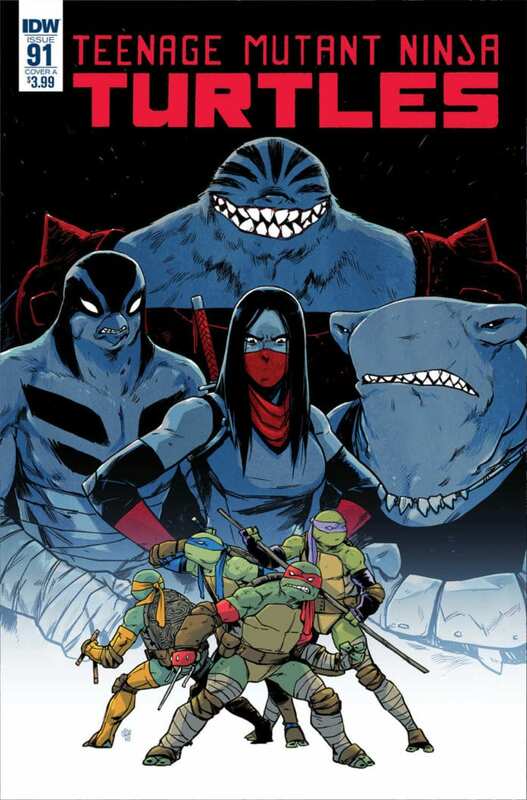 IDW’s TEENAGE MUTANT NINJA TURTLES series has had its fair share of surprises. Most recently, we’ve seen Master Splinter take over as leader of the Foot Clan, potentially bridging an age-old rivalry between it and the Hamato clan. But now Oroku Karai, granddaughter of the Shredder, is paying a visit to Splinter and has her sights set on the role of clan leader. Karai is a character who has long-respected the legacy of her grandfather. Though at times disagreeing with his methods, she nonetheless made it her life’s work to honor and rebuild their family’s Foot Clan after his death. 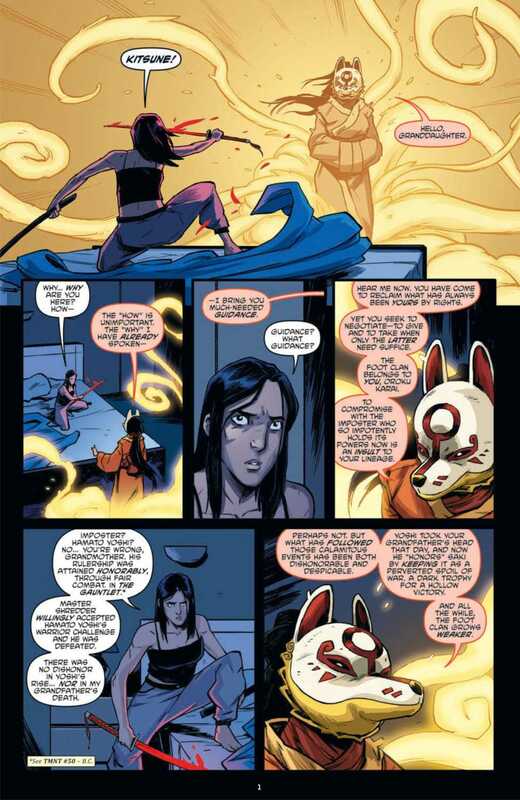 This plan comes to a head when her grandmother speaks to Karai in a vision one night, imploring her to usurp the role of clan leader from Splinter. Tom Waltz, Kevin Eastman and Bobby Curnow do an amazing job of giving Karai a believable reaction to the request. We relate to Karai’s feelings of longing to uphold her family’s tradition as well as the resistance to her grandmother’s hate-filled motivations. Karai’s desire to do good shines through in this moment of personal anguish, allowing readers to sympathize with her character. We also see a similar conversation take place between Leonardo and Splinter. 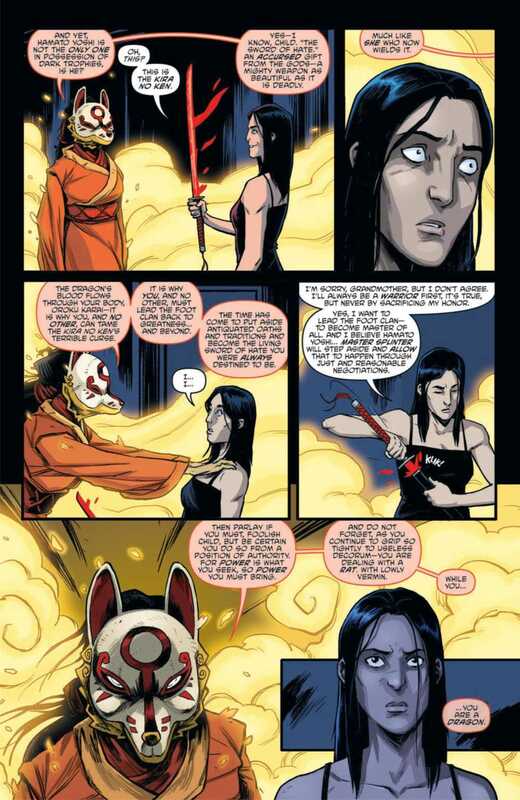 The former claims the role of clan reader should go to Karai and appears to be collaborating with her. Splinter’s confusion and pain at this is remarkably similar to Karai’s from earlier in the story; each is a distressed person wondering why their family has been so dishonored. Another great feature of this story was the comparison between Karai and Leonardo. Both serve as the designated leader of their respective ninja teams, so it was great to see the similarities and differences in their styles. Karai and Leondardo’s attempt to control a brawl between Raphael and Ocho is played out in perfect symmetry, highlighting each character’s unique style of leadership. Karai, Splinter and Leonardo serve as solid points of focus in this issue. The story does a good job of highlighting their importance in the future of the Foot Clan. Michael Dialynas and Ronda Pattison provide excellent artwork that’s fitting of any good ninja story. The action scenes are drawn with a fluidity that adds energy to each panel. Each fighter’s form is clearly distinguished from the others. Though these scenes were minimal, they were a great reminder that this is first and foremost a ninja story. The artists also find a way to add excitement to the dialogue-driven scenes as well. 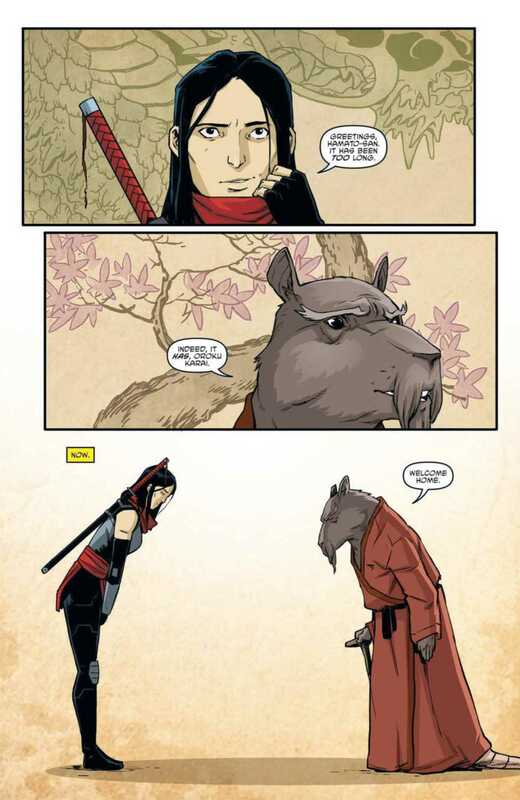 Readers see the wide range of emotions in Karai, ranging from the sadness and anger expressed with her grandmother to the thoughtful, kind demeanor she employs when speaking with Splinter. It’s this attention to detail that brings characters to life. This story threw another wrench into the Foot Clan and showed us a lot of great characterization for Kairi. Waltz, Eastman and Curnow seem to be setting her up for something big in future issues, but only time will tell. What did you think of Karai’s confrontation with Splinter? Let us know in the comments below!